Bali Pulendran (foreground), pictured here with Dmitri Kazmin, is widely credited with pioneering the field of systems vaccinology. The National Institutes of Health has awarded an Emory-led research consortium $15 million over five years for renewal of a grant aimed at better understanding and improving human immune responses to vaccination. The grant builds on the pioneering accomplishments of the research team over the past several years in developing "systems biology" methods to accurately predict the efficacy of vaccination in humans, and providing new insights into the molecular mechanisms that drive effective immunity to vaccination. 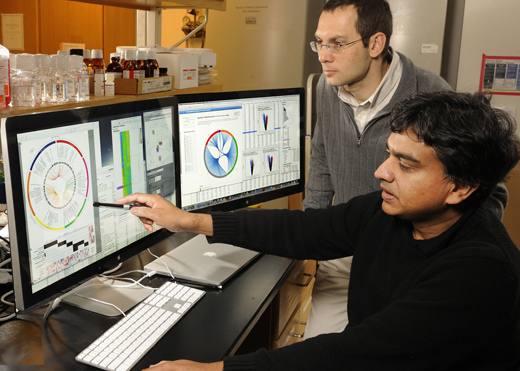 Systems vaccinology combines immunology, genomics and bioinformatics to predict the effectiveness of a vaccine without exposing individuals to infection, and offers a means to probe the molecular mechanisms underlying immunity to vaccination. Researchers already have provided proof of concept of this approach through studies of innate and adaptive human immune responses to vaccines including yellow fever, smallpox, seasonal influenza, meningococcal disease and dengue fever. Co-principal investigator is Rafi Ahmed, PhD, director of the Emory Vaccine Center and a Georgia Research Alliance Eminent Scholar. The National Institute of Allergy and Infectious Diseases will administer the grant as part of its Human Immunology Project Consortium (HIPC) program. The research team also includes scientists at the Broad Institute; Dana Farber Cancer Institute; Georgia Institute of Technology; University of California, Berkeley; University of Chicago; University of Colorado; University of Sao Paolo, Brazil; and several pharmaceutical firms. "Although most of our team’s studies thus far have focused on healthy young adults, the renewal grant will allow us to expand the reach of our study to include vaccine responses in populations that are particularly vulnerable to infections: infants, the elderly, and transplant patients," says Pulendran. "This is a critical need because we know elderly individuals have weaker immune responses overall, and transplant patients have compromised immune responses due to immunosuppressive drug therapy. We want to be able to offer more effective vaccines across the lifespan as well as address myriad health-care concerns," he continues. The team will focus on two primary projects: (1) immune response to vaccination against varicella zoster virus (VZV), which causes chicken pox in young children and shingles in adults, and (2) immune response to pneumococcal vaccines in transplant patients. In the first major project, researchers will study immune responses to vaccination against VZV in children and the elderly with the aim of developing new insights into the immune response at the two extremes of age. VZV vaccination is the standard of care for both infants and the elderly, but Zostavax, the licensed Merck vaccine against VZV, has limited efficacy against shingles, especially in people older than 70. Recently, the results of a randomized phase 3 trial of Glaxo Smith-Kline’s new investigational recombinant Herpes zoster subunit (HZ/su) vaccine has shown an overall vaccine efficacy of 97.2 percent across age groups, including people over 70 years old. These results represent somewhat of a paradigm shift in vaccinology because the usual barrier of immune senescence to vaccination in the elderly (the gradual deterioration of the immune response) appears to have been overcome. However the mechanisms by which this vaccine induces protective immunity in the elderly remain unexplored, and a major focus of the program by Pulendran and colleagues will be to use systems approaches to delineate such mechanisms. In addition, the researchers will study immune responses to vaccination against varicella infection (chickenpox) in children. Although the Varivax vaccine (identical to Zostavax but at a lower dose) is highly effective in preventing chickenpox in young children, there is little known about the nature of innate and adaptive immunity to vaccination in children. The new systems approach will include a detailed analysis of the immune response to Varivax in children. A second major focus will evaluate immune response to pneumococcal vaccines in kidney transplant patients who are on T cell immunosuppression therapy. Pneumococcal diseases are responsible for 1.6 million deaths per year globally, and the rate of invasive pneumococcal disease is 60 times greater in kidney transplant patients than in the general population. Researchers believe their new systems analysis of vaccination against pneumococcal disease in transplant patients on immunosuppressive therapy will yield important new insights that could provide new vaccination guidelines and a broader understanding of the dynamic changes following vaccination in this special population. "Systems biological approaches offer a unique way of probing the molecular mechanisms driving immunity to vaccination in humans, and offer exciting new insights about the workings of our immune system," notes Pulendran. "This approach has already resulted in new insights into the fundamental mechanisms of immunity, and we are excited about the opportunity to dissect the reasons for differing responses to vaccines in individuals and special populations at the extremes of age. This will help guide clinical trials to evaluate new vaccines and future vaccine recommendations." Additional investigators for the consortium include Mark Mulligan, Nadine Rouphael, Evan Anderson and Aneesh Mehta, Emory University, and Myron Levin and Adriana Weinberg, University of Colorado (clinical core); Nick Haining, Dana Farber Cancer Institute and Broad Institute, Shankar Subramaniam, UCSD, Jill Mesirov, UCSD and Broad Institute, Nir Yosef, University of California, Berkeley, and Eva Lee, Georgia Institute of Technology (computational and single cell core); Tianwei Yu, Emory University (data management and statistical core); and Helder Nakaya (University of Sao Paolo) and Shuzhao Li and Dmitri Kazmin, Emory University.